Green ants that defend their tree by attacking anyone who touches it...a mysterious lava-tube cave with hikers' flashlights floating like fireflies down into its blackness...fruit bats noisily lobbing mangos onto your cabin's tin roof. The beauties -- and dangers -- of the crocodile-infested Kakadu National Park. A crash landing at a remote island airstrip...a rugby match in Northern Territory (and why Aussie girls never "root" for their teams). In this colorful and remarkable book, written by a colorful and remarkable woman pilot, you'll find the most enjoyable way to discover Australia -- by flying a light airplane to its places of greatest interest while watching the exotic landscape unroll beneath you. Vistas of giant paisley patterned earth, caused by underlying salt strata. Stunning views of red landscapes, uplifted and contorted during the earth's primordial boil. The enormously long white beaches of Western Australia, lonesome and edged by brilliant aquas. And the Indian Ocean to the south, marked by hundreds of miles of cliffs. Whales breed there...You could get lucky. You don't have to be a pilot to enjoy this book. 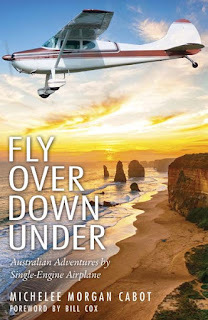 The author wrote it also for non-flyers, in non-technical terms, to let you see amazing things that pilots experience from their very special perspective. You'll want to read it, re-read it, and share it with your friends. MICHELEE MORGAN CABOT has been flying for nearly fifty years, logging more than 5,000 hours of flight time, including these in Australia. She holds a commercial license (both single engine land and glider) with instrument rating and a tow pilot endorsement.